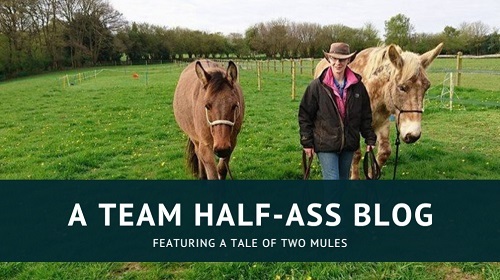 It’s been a while since I’ve been able to bring you a Mule Tale, so I’m thrilled to return with a long-ear from the UK! 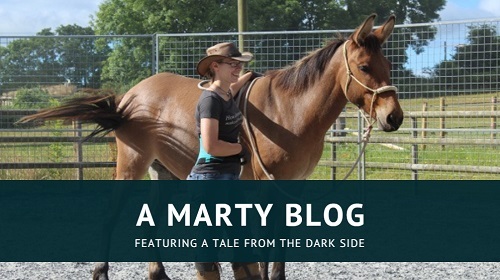 As I now spend a lot of time seeking out and editing content for Horsemanship Magazine, I’m really grateful when a mule owner approaches me; I love bringing you these Tales, but I just don’t have as much spare time as I did. So if there’s anyone out there who would like to be featured … let me know! 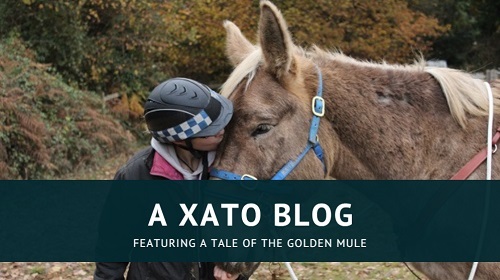 Anyway, this is the story of Mavis: the glossiest mule this side of, well, anywhere! 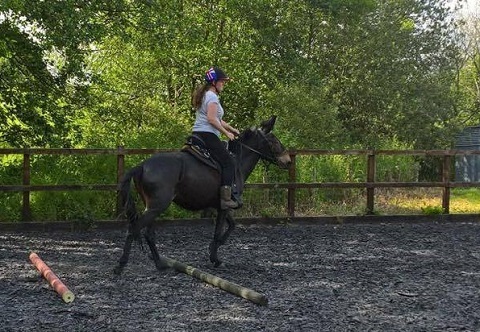 Her owner, Yvonne, had been searching for a mule for some time and it’s brilliant to see the two of them together. My mule is a molly mule called Mavis. She is approx 10-years-old. 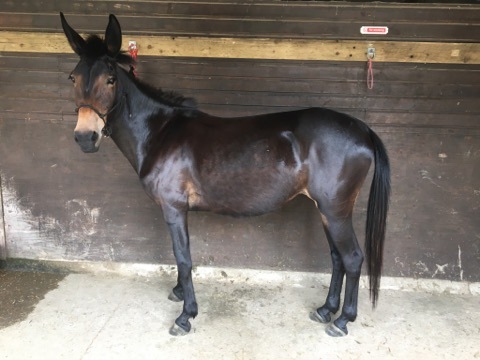 She is dark bay and approx 15hh. 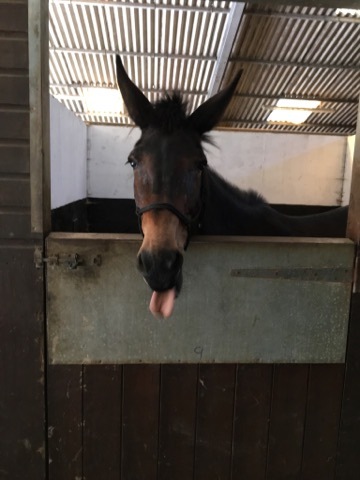 I’ve been told she was born in Oxfordshire and her mother may have been a Trotting mare. I saw her advertised on Preloved along with another mule. I went to see them and Mavis picked me! I’ve only had her 3 months but I ride her. I’m having Western riding lessons on her. At the moment we are going back to basics with ground work and this has helped us to bond. 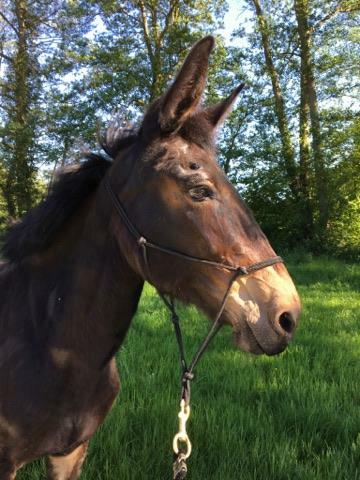 I’ve only ridden her in the school but I hope to hack her out on the many lovely bridle paths soon. I’d also like to take her to shows and do dressage, trec and jump her. I haven’t jumped her but my friends have and she’s good at it! My mule is kept at a livery yard with 14 horses. 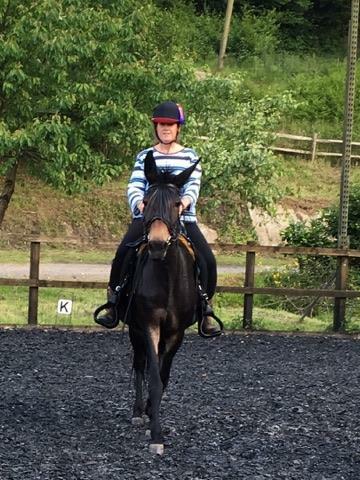 I am very fortunate that everyone at the yard is so kind and friendly and all the horses and owners love Mavis. All of the horses are well trained, regularly ridden and generally bomb proof. When I got Mavis I wanted her to be like them but she wasn’t, and I was concerned that she wouldn’t fit in with her quirky little ways; but with every passing day she learns something new, and I couldn’t be more proud of her. She calls to me when she hears me and we have such a close bond. I can’t imagine life without her now. Be fair, be consistent, don’t ask for the impossible and give your mule the opportunity to succeed. The advice I’d give a new mule owner is take time to bond, don’t be in a rush to get out riding or driving or whatever. 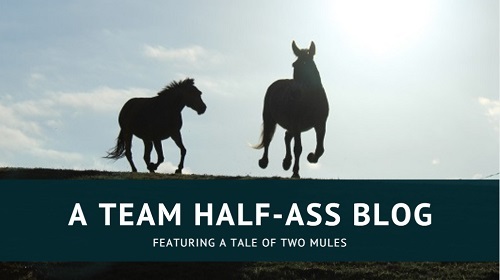 Mules live a long time and have very good memories so get it right from the start. Oh and don’t forget to lavish your mule with love, they are so affectionate.